I was walking on the beach taking in the views, fresh air, and aloneness, when my eyes caught a moving rock to my right. Come again?!? Moving rock? Closer inspection revealed that all is good with the universe and rocks don't move. 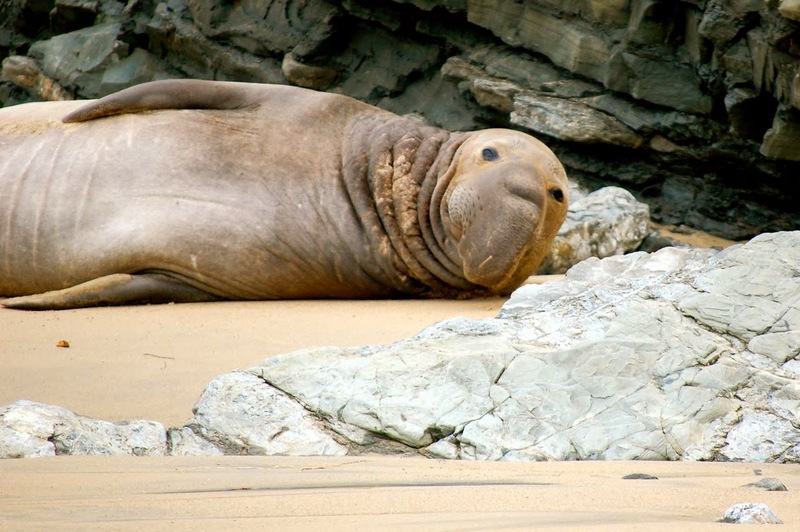 The moving object turn out to be a giant elephant seal (they can grow up to 5 meters and weigh up to 2500 kilograms!) taking a nap on the beach. The seal must have sensed my presence as it opened it's eyes, slightly raised its head and looked attentively in my direction. I showed it respect by keeping a safe distance and passing it as slowly and gracefully as I could. It worked. The seal decided that I'm not a threat and it went back into the land of dreams, in which, I'm sure, there are no humans.